Flooding can occur on a property through a variety of ways. Hurricanes, flash flooding, burst pipes or leaking foundations are a few examples. Regardless how the water flooded into your home or business is irrelevant. The goal is to have it cleaned up quickly and correctly. If you haven’t experienced a flood before, how do you even know where to start? Bottom line, flood damage in your home or business is downright overwhelming. It is essential to act fast and choose a contractor who is experienced, licensed, and trustworthy to get the job done. In fact, when flood damage is left sitting for longer than 48 hours, serious complications can begin to develop. This includes but is not limited to mold growth, development of harmful bacteria and irreversible structural damage. The longer you wait, the worse the flood damage. Call AF Environmental to restore your property to its pre-loss condition. AF Environmental is certified by the IICRC and fully equipped to respond to flood damage events of all sizes. Open 24 hours a day, 7 days a week, our crews have the capacity to respond to your emergency immediately. As one of the industry leaders in Texas for emergency water restoration, we invest in only the best technology to help extract, dry and mitigate standing water from flood damage in the least time possible. In cases where your insurance company is involved, we have dedicated staff to handle the claims paperwork- submitting the right photos and reports when needed. AF Environmental services the Dallas/ Ft. Worth metro area. Established in 2004, our service area includes but is not limited to the counties of Tarrant, Parker, Dallas, Denton, Collin, and Johnson. If you are dealing with an unexpected flooding, give us a call immediately. When floodwaters infiltrate your home or business, how do you know the contractor you choose will get the job done right? When you choose AF Environmental, we have a proven restoration process in place to take on flood damage projects of all sizes. Even though each project presents its own set of unique challenges, our process serves as a check-list to effectively restore your property. To provide the best level of service, we must first identify the cause of the damage. Our next step is to evaluate the affected areas and determine both obvious forms of flood damage and identify hidden flood damage as well. Based on the parameters of the IICRC, we will extract any remaining standing water with our high-powered truck mounted units. 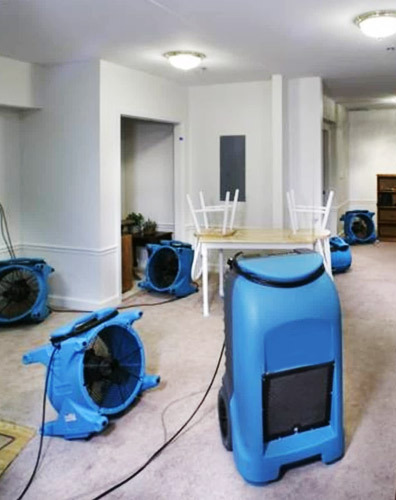 Next, we will place air movers and dehumidifiers around the affected area with a targeted RH goal of 60 or below. Any damage discovered behind walls or within the subfloor will be dried using advanced structural drying techniques. Our technicians will return every day to take measurements and will adjust as needed. Some adjustments may be simply taking equipment out as the affected area successfully dries. Once we have achieved our drying goals, and mitigation has been completed, we will do a walk-through of the affected area to show that restoration has been completed. Flood damage can be an extremely stressful and overwhelming event. Choose a company who can take the stress off your plate, and get the job done right in a fast and efficient manner. AF Environmental is certified by the IICRC in flood damage restoration services. We are also licensed, bonded and insured to handle projects of all sizes. Available 24 hours a day, 7 days a week allows us to respond quickly regardless the time of day. Equipped with a team of qualified technicians and a truck full of state of the art equipment, our crews can get in and out quickly- returning your life to normal.